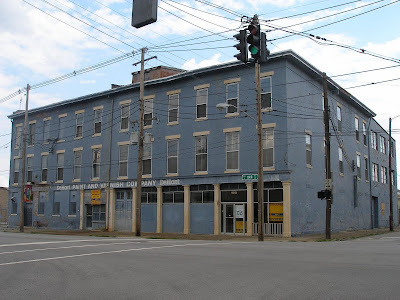 Whitewashed Windows and Vacant Stores: DeHart Paint and Varnish Co. This old paint factory at 900 E. Main, right along the line where Butchertown starts to become Downtown Louisville, was built in 1880 and is sitting totally empty. At one time there had been big plans for $250,000 condos here but apparently the economy's kiboshed that project, because the realtor's signs are back up on the property now. I remember the artist Bill Fischer telling me that Jackson Pollock had ordered a pallet-load of specially-formulated paint from a Louisville paint factory just before he died, and that Bill was only too happy to take the stuff off their hands. I'm wondering if this is the paint factory in question, because I was watching the documentary Who the #$&% Is Jackson Pollock? the other day on Sundance, and noticed some DeHart paint cans in footage of his studio.